Occasional comments on the situations at my favorite football club - Internazionale Milano. For opinions I cannot express in 140 characters on Twitter. One thing that's been on my mind for quite some time now is why Roberto Mancini seems to have an affinity for players that come from the ex-Yugoslavian countries. Though I would not call this an obsession for him, it is clear that his teams are constantly connected to players from these countries (Inter was dubbed "InterIC" during pre-season, before Kovacic left, when most people thought that they'd see all of Kovacic, Perisic, Jovetic, Brozovic on the same team; IC is the usual duo of letters on the tails of surnames of people who come from Serbia, Montenegro, Croatia, Bosnia and Herzegovina and a little less frequently Slovenia). There's also other players that have been with him across clubs (some of them owe a lot of their development to him) such as Kolarov, Nastasic, Mihajlovic, Stankovic etc. (the last 2 of which are important not only as a product of his interest in Yugoslavian footballers, but also as a cause to it - I will mention them later). He also wanted Stevan Jovetic while he was at City. Now, I have been given counter-arguments (by my friend Badar Akhtar - @ILPazzinho77 on Twitter) such as that Jovetic and Kolarov were already well known at the point where he wanted them at City, and that Inter's interest in Brozovic (as well as some other Dinamo players who are reportedly on Inter's radar right now) is the product of Inter's good relations with Dinamo, and come down above all to Ausilio's interests rather than Mancini's. He also said that players from ex-Yugoslavian countries are normally cheaper than talents from South American countries would be. And these things hold their water. But, I'm still quite sure that there are indicators pointing to his abovementioned affinity, and I've finally forced myself into a little "research" today, so I delved into Mancio's past to see what could be the cause. Little did I know that the answers were quite easily discernible, though I would have you know that what I'm writing here is simply based on indications, not on anything he's said or a biography of him (I haven't seen him comment on this anywhere). Namely, the most obvious (and probably also initiating and most important) influence in this sense probably came from Vujadin Boskov. 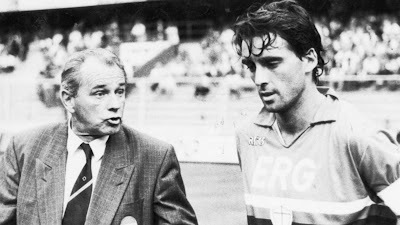 The legendary coach from Vojvodina led Mancini during the period between 1986 and 1992 at Sampdoria, where Mancini was perhaps the key player. Boskov was a very important part of Yugoslavian football, being one of Yugoslavia's most esteemed people, and especially having led Yugoslavia during the Euros in 2000 in Belgium and the Netherlands, and also from 1971-1973 before that. Boskov was Mancini's coach for 6 years! Another wave of influence surely came from Sinisa Mihajlovic, the current head coach of Milan. Mancio and Mihajlovic are close friends to this day, but they met as players of Sampdoria, where they played together from 1994 to 1997, at which point Mancini departed for Lazio. Mihajlovic followed him there in 1998 and they together until 2001. 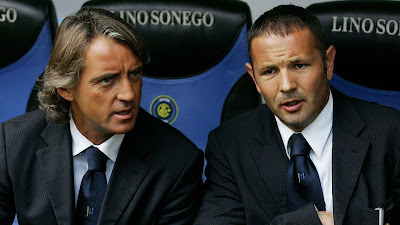 After that, Mancini became coach of Lazio in 2002 and coached Mihajlovic until 2004, at which point Mancini moved to Inter, only to bring Mihajlovic to play for Inter and coach him until Sinisa retired in 2006. After Mihajlovic retired, Mancini made him his assistant from 2006 to 2008, when Mancini left the club and Mourinho came in. They've worked together for 12 years, and even when they didn't work together they remained close friends. Another influence, as I've mentioned before, is probably also Dejan Stankovic. Stankovic and Mancini met as players of Lazio, where their stays overlapped in the period between 1998 and 2001. In 2002, Mancini became coach of Lazio, and coached Stankovic. Later, when Mancini became the coach of Inter, he brought Stankovic to the club in 2004 and remained his coach until the departure in 2008. There is also the fact that with Mancini's return to Inter last season, he didn't wait long and re-called Stankovic to the club, making him team manager this summer. That's more than 10 years spent together for the 2, in 2 different clubs. There is also Alen Boksic, the Croatian striker who played for Lazio. Boksic played for Lazio from 1997 to 2000 (his 2nd stint, having played for them also from 1993 to 1996), so they spent 3 years together with Mancini. I am not aware of any special connection formed between the two during this period, though. Each one of Boskov, Mihajlovic and Stankovic are influential characters in Yugoslavian football, and each one of them bore the quality of Yugoslavian football culture in a different way. I firmly believe that it brushed up on Mancini as well, and his appreciation is not only visible in the later acquisitions of Nastasic, Kolarov, Brozovic, Jovetic, but especially on the fact that he carries Mihajlovic and Stankovic around with him. It is not at all weird that Mancini has warmed up to Yugoslavian football culture. Living in one of the countries of ex Yugoslavia (Macedonia), I've personally witnessed some and heard about all other successes that Yugoslavia (and subsequently the countries that remained of it after its tragic dissolution) has noted in football. Yugoslavia is the home of Red Star Belgrade - a club that won the European Champions Cup in 1991 (on the brink of Yugoslavia's dissolution) v. Marseille, with players such as Vladimir Jugovic (later played for Inter), Darko Pancev (later played for Inter), Robert Prosinecki, Dejan Savicevic and, indeed, Sinisa Mihajlovic. They've also won the Mitropa Cup twice in 1958 and 1968, and later finished as runners up in the ECC in 1979, the last season of the legendary Dragan Dzajic, among other great players of that time. Then there's also Croatia's success at the 1998 World Cup in France, where they finished 3rd, eliminating Germany in the quarter finals with an emphatic 3-0 triumph. They lost in the semi finals to host country France, who would later go on to win the tournament, and beat the Netherlands in the 3rd place playoff with 2-1. Croatian striker Davor Suker, who played for Real Madrid at the time, finished the tournament as top scorer with 6 goals scored. This Croatia team also included legendary Zvonimir Boban, Dario Simic, Robert Prosinecki and current West Ham coach Slaven Bilic. Other great names that have emerged from the Yugoslavian spaces over the years include Dragan "Piksi" Stojkovic, Predrag Mijatovic, Dragoslav Sekularac, Savo Milosevic etc. Though clubs from the ex-Yugoslavian countries haven't noted any significant success in recent years, there are a number of players who have broken through the ranks of great names such as Red Star Belgrade (the first club of Nemanja Vidic), Partizan Belgrade (who, by the way, produced Stevan Jovetic), Dinamo Zagreb (Modric), Hajduk Split etc. to go on and become leading names in world football. In short, it is a team that could easily challenge the very biggest bosses of world football right now.